The conga-QA is fitted with the latest Intel® Atom™ Z5xx range of processors and the Intel® US15W system controller hub. 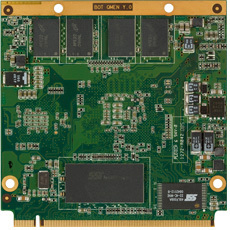 The new module provides fast, serial differential interfaces such as PCI Express and SATA, although it consistently avoids old “legacy“ interfaces such as EIDE and PCI to ensure that future generations of CPUs and chipsets can also be used without problems. It provides 8x USB 2.0, 1x SATA, 1x SDIO, 1x PCIe, LPC bus, I²C bus as well as gigabit Ethernet and high definition audio.